Jacqueline A. Travisano is the Executive Vice President for Business and Finance and Chief Operating Officer of the University of Miami (UM), nationally ranked by U.S. News and World Report among the top 50 universities in the country. With deep expertise in running complex organizations, she currently serves as an executive officer directly responsible for providing operational, financial, entrepreneurial, and environmental services that enhance the academic, clinical and research experience of faculty, students, staff, patients, and the local community. Specifically, the units of finance, human resources, technology, facilities, risk management, internal audit, compliance, campus police, auxiliary operations, supply chain, budget and planning are within her line of responsibility. Dr. Travisano’s career encompasses nearly three decades of service to higher education and non-profit organizations in optimizing the operations and national recognition of these institutions. She served Nova Southeastern University (NSU) as Executive Vice President and Chief Operating Officer, where she collaborated with academic leaders there to significantly raise undergraduate admissions standards, greatly improve student retention, and constructed cutting-edge facilities for research, leading to increased research expenditures, and propelling NSU’s to its first-ever national ranking by U.S. News and World Report. As Vice President for Business Affairs and Chief Financial Officer at St. John’s University, Dr. Travisano successfully directed the university’s finances during a historic global financial crisis. Dr. Travisano began her career in 1990 at Coopers & Lybrand. Dr. Travisano has consistently received special recognitions and awards throughout her career. Named one of South Florida’s Influential Business Women by the South Florida Business Journal, the National Diversity Council’s Glass Ceiling Award, the March of Dimes Woman of Distinction, and Woman of the Year by the 1,000 Plus Club for Cancer Research, and as Student of the Year by her doctoral colleagues at the NSU Abraham S. Fischler College of Education. She has also been twice-honored by Boys and Girls Club of Broward County as one of Broward County’s Top 100 Women and the Florida Diversity Council named her as one of Florida’s Most Powerful and Influential Women. Dr. Travisano has most recently been named a member of Board of Directors of AutoNation, the largest automotive retailer in the United States and number 129 on the Fortune 500 list of America’s largest corporations, where she serves as a member of two committees: Audit and Technology. She also serves the Robert Morris University School of Business Board of Visitors. Dr. Travisano’s many charitable works included service to the Board of Directors for the ARC of Broward County, the Special Olympics of Broward County, and the March of Dimes of Broward County. Dr. Travisano is also a member of the Royal Dames for Cancer Research. In 2014, she served as Chair of the 45th Annual Royal Dames Tiara Ball, raising more than $400,000 for cancer research. 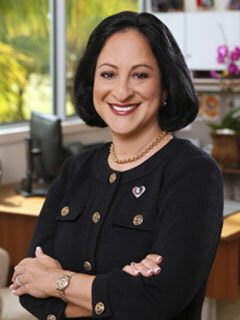 She is currently serving on the Board of Directors for the United Way of Miami-Dade County. Dr. Travisano holds a Doctorate in Higher Education Leadership from Nova Southeastern University, an M.B.A. from Chatham University, a B.S. in Business Administration from Robert Morris University, and is a Certified Public Accountant.